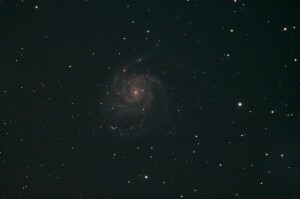 Explanation The larger spiral galaxy in the center of the photo is M51 also known as NGC 5194. The smaller yellowish galaxy is the interacting companion galaxy NGC 5195. 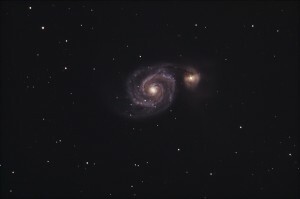 Recent simulations indicate that M51's spiral structure was caused by NGC 5195 passing through the main disk of M51 about 500 to 600 million years ago. A black hole, surrounded by a ring of dust, is thought to exist at the heart of M51's spiral. Notes Poor transparency. Had difficulty focusing. Explanation A spiral galaxy approximately 3 million light-years away in the constellation Triangulum. In 2007, a black hole about 15.7 times the mass of the Sun was detected in the galaxy using data from the Chandra X-ray Observatory.